I decided to ask the Rebbe what to do. During those years I would usually visit the Rebbe twice a year – for Simchat Torah and Shavuot. Usually, I refrained from bringing up yeshivah matters during my private meetings with the Rebbe, since this was not my prerogative. The head of the yeshivah, Rabbi Ephraim Wolff, sent the Rebbe detailed reports of what was discussed in staff meetings, including our disagreements, and I did not want to interfere with this process. But this time, because of the heated debate that had taken place and because this was bothering me very much, I could not hold back. 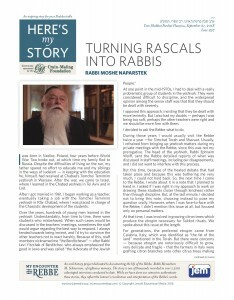 So, the next time I came to the Rebbe, I wrote about it in a note that I planned to hand in. I asked if I was right in my approach to work on drawing these students closer through kindness rather than through discipline. But, at the last minute, I decided not to bring this note, choosing instead to pose my question orally. However, when I was face-to-face with the Rebbe, I didn’t mention this issue at all, but focused only on personal matters. At that time, I was involved in growing citron trees which produce the etrogim necessary for Sukkot rituals. We spoke about this issue at the length. For generations, the preferred etrogim came from Calabria, Italy, which was identified as “the fat of the land” mentioned in the Torah. But there were concerns – because etrogim are notoriously difficult to grow, very delicate and fragile – that the farmers in Italy were grafting citron branches onto other citrus trees making the fruit unfit for the mitzvah. Indeed, there was an agricultural plot in Calabria which was guarded by people from Chabad so that this shouldn’t happen. Also, the Rebbe had instructed his emissaries in Italy to send the preferred seeds to Israel because, the Rebbe said, the day would come when it would be very difficult to find a non-grafted Calabria etrog, and the better etrogim would come from Israel. My father-in-law, Rabbi Avraham Shmuel Gorelik, was the one who planted the first orchards of Calabria etrogim in Kfar Chabad, and later on I, too, became involved in this project. All the while we worked under the guidance of the Rebbe. At the end of the Hebrew month of Tishrei of 5751 (1990) – which the Rebbe dubbed “the year of wonders” – I asked the Rebbe to give me the etrogim that he used that year, so that I could plant them in our orchard in Kfar Chabad. The Rebbe gave us two etrogim. From those two etrogim, we managed to get fifty-four seeds, which we sprouted and nurtured until they could produce fruit. In the beginning, we planted a relatively small section from those seeds, mainly for the use of Chabad chasidim. But, later on, we discovered that there is a great demand for these etrogim among the general public, from all streams of Judaism, and therefore, as time went on, all our orchards were planted with cuttings from those first trees that grew from the seeds of the Rebbe’s etrogim from that year. After discussing the issue of the etrogim with the Rebbe, I started to leave, but the Rebbe motioned that I should come back. I was stunned. The Rebbe – of his own accord and initiative, without me asking this question which was troubling me so much, without my mentioning a single word about it – gave me a clear answer that I was not wrong! Kindness was the way to deal with these difficult students. I did as the Rebbe advised. Today all these difficult students are leaders in Chabad. Every single one of them! Rabbi Moshe Naparstek (1935-2016) served on the faculty of the Tomchei Temimim yeshivah in Kfar Chabad, Israel, for more than fifty years. He was interviewed in March, 2014.